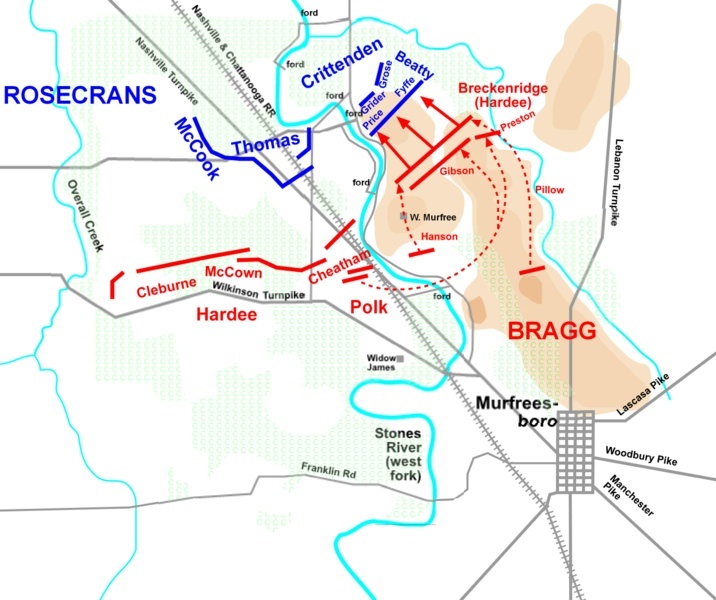 Union and Confederate movements and positions the night of December 30 to December 31, 1862. 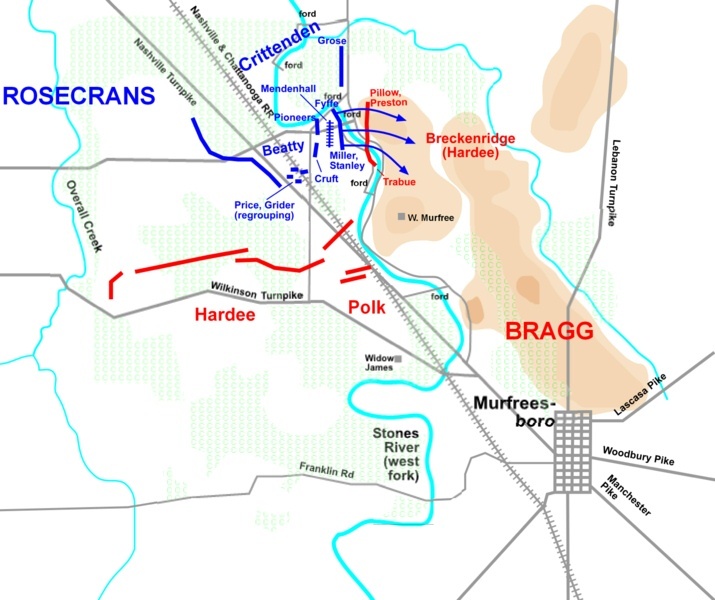 Union and Confederate battlefield positions on December 31, 1862, 8:00 a.m.
Union and Confederate troop positions on December 31, 1862, 9:45 a.m.
Union and Confederate armies at Stones River on December 31, 1862, 11:00 a.m.
Union and Confederate forces at Stones River on December 31, 1862, 4:00 p.m.
Union and Confederate battlefield positions on January 2, 1863, 4:00 p.m.
Union and Confederate troops at Stones River on January 2, 1863, 4:45 p.m. 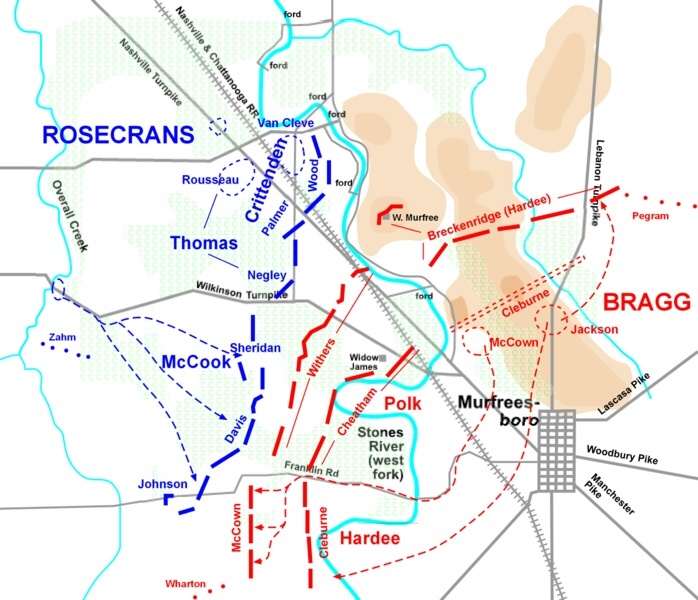 Recommended Reading: CIVIL WAR IN WEST SLIP CASES: From Stones River to Chattanooga [BOX SET], by Peter Cozzens (1528 pages) (University of Illinois Press). Description: This trilogy very competently fills in much needed analysis and detail on the critical Civil War battles of Stones River, Chickamauga and Chattanooga. 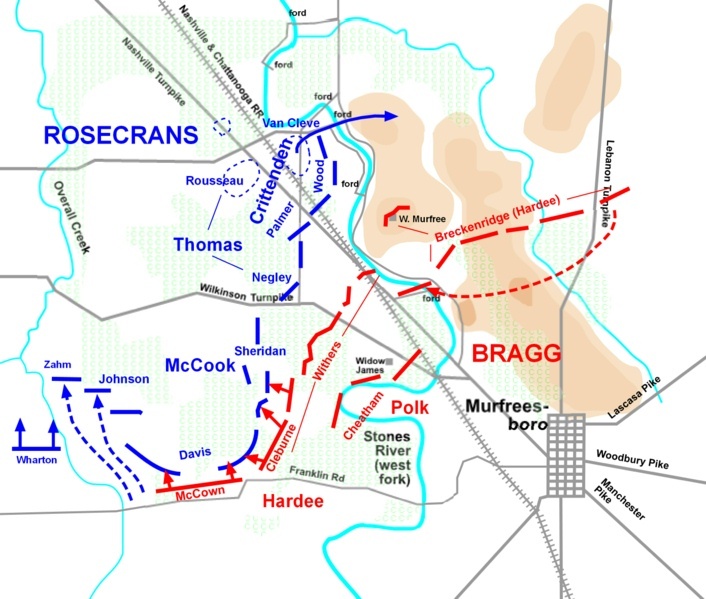 "Cozzens comprehensive study of these three great battles has set a new standard in Civil War studies....the research, detail and accuracy are first-rate." Continued below. Mr. Cozzens' has delivered a very valuable, enjoyable work deserving of attention. The art work by Keith Rocco is also a nice touch, effecting, without sentimentality...historical art which contributes to the whole. 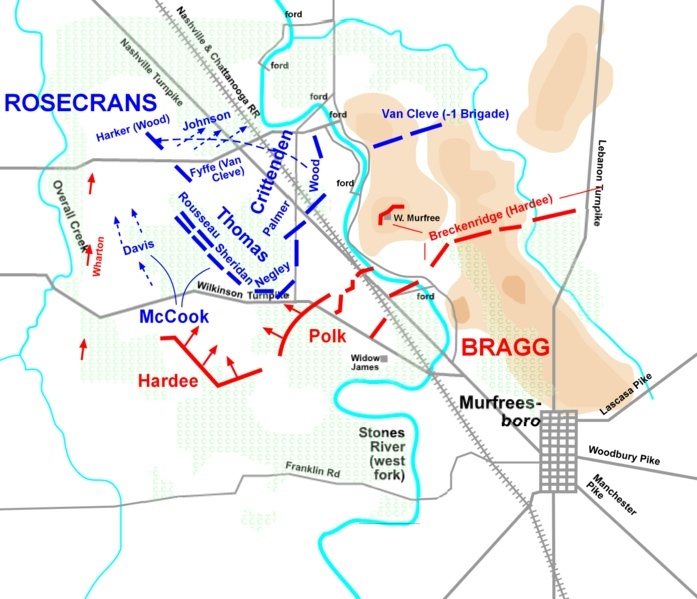 Recommended Reading: Shiloh and the Western Campaign of 1862. Review: The bloody and decisive two-day battle of Shiloh (April 6-7, 1862) changed the entire course of the American Civil War. 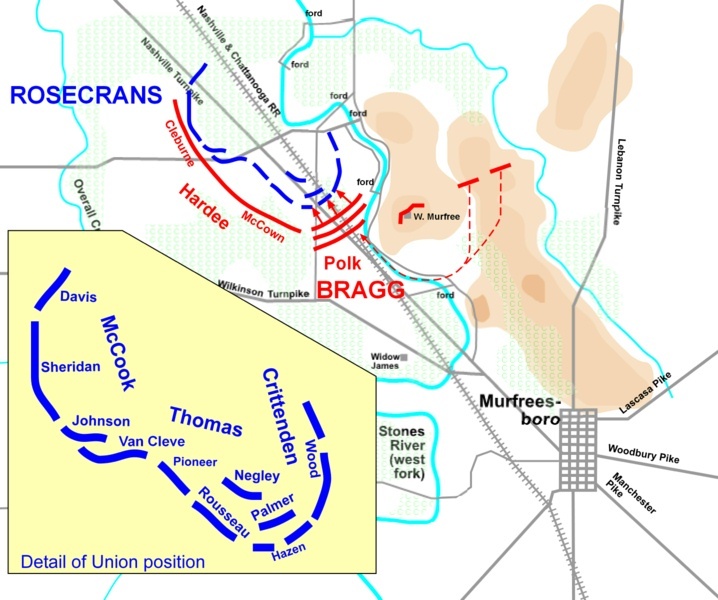 The stunning Northern victory thrust Union commander Ulysses S. Grant into the national spotlight, claimed the life of Confederate commander Albert S. Johnston, and forever buried the notion that the Civil War would be a short conflict. 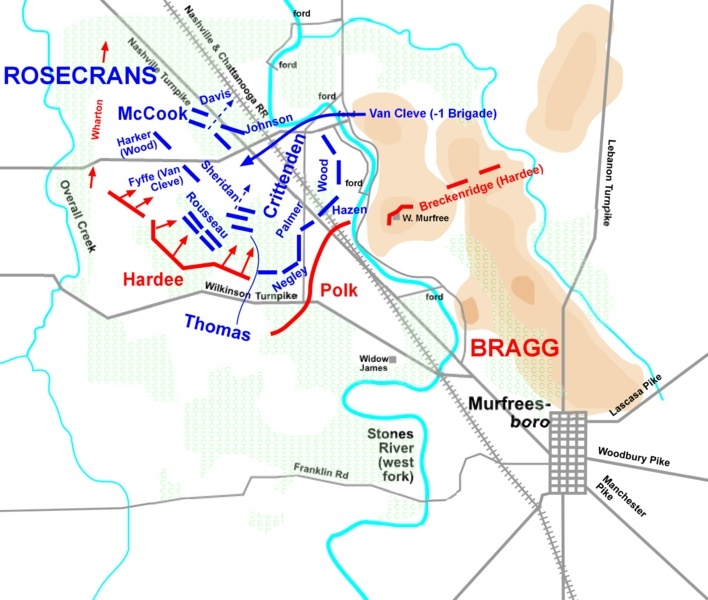 The conflagration at Shiloh had its roots in the strong Union advance during the winter of 1861-1862 that resulted in the capture of Forts Henry and Donelson in Tennessee. Continued below.